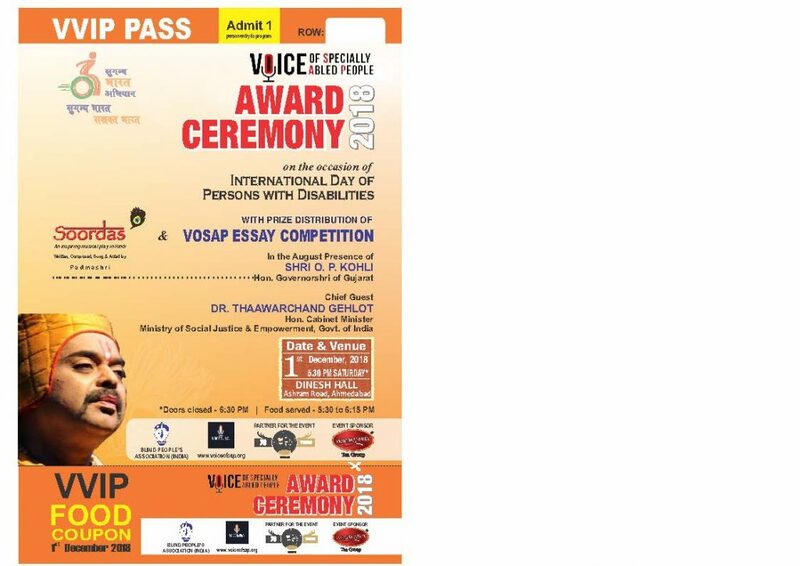 Voice of SAP congratulates winners of VOSAP Essay Competition 2018! These winners presented their views, dreams on Accessible City and Inclusive Society for Divyangjan (Specially Abled People) with Essay write up. Subsequently in the Popularity round, they inspired thousands of people to support their dream, “Like” their essays. The winners also contributed towards achieving their dream by doing actual volunteer work using VOSAP mobile app. As a result of these 3 criteria, we are very proud to announce the following list of winners form top 40 shortlisted essays in round 1 selection. Additional 15 winners of Rs 1,000 each. On 1st December, in August Presence of Shri O. P. Kohli, Governorshri of Gujarat and Chief Guest of the VOSAP Award Ceremony Event, Dr Thaawarchand Gehlot ji, H’ble Minister of MSJE (Ministry of Social Justice and Empowerment), Govt. of India along with Hon. Shakuntala Gamlin, IAS, Secretary in MSJE, Hon. Shri Prabodh Sheth, Jt Secretary, DEPwD, MSJE, Hon Dr Kirit Solanki, Member of Parliament, Hon Shri D N Pandey, IAS, Commissioner of Disability, Govt of Gujarat, Hon Shri Ramanbhai Vora, Ex-Speaker of Gujarat Assembly, Hon Shri Vikrant Pandey, Collecotrshri of Ahmdebad District, Hon. Shri Piyush Desai, Chairman of Waghbakri Tea Group and Shri Pranav Desai, Founder of Voice of SAP awarded the winners with the prizes and certificate. 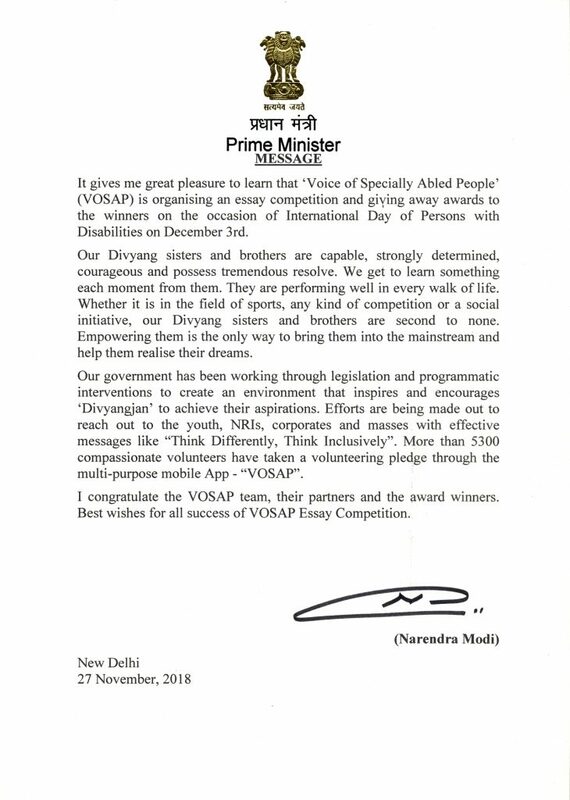 Once again, Voice of SAP is very happy for mobilizing thousands of youth to think on accessibility and inclusion of Divyangjan which resulted into identifying top volunteers, thought leaders who will be “Change Makers” in the society. Voice of thanks the eminent jury members (Dr Usha Upadhyay, Dean of Gujarat Vidyapeeth, Dr Gaurang Jani, Head of Dept, Gujarat University, Shri Jasubhai Kavi, Ex-principal of BPA, Ms Nandita Thakor (USA) and Ms Usha Desai (USA)), who did online rating of each and every essay as part of their volunteer service to the society, without any remuneration. Voice of SAP volunteers worked a lot for past 4 months along with Blind People’s Association team led by Dr Punanisaheb to create this high impact, dignity enhancer event for disability sector in partnership with GCCI (Gujarat Chamber of Commerce and Industries) and over 40 sponsors who believe into VOSAP mission, vision and execution strategies. Here is the link for the souvenir which includes messages from Hon PM of India, Governorshri of Gujarat, Hon Minister of Govt of India and Govt of Gujarat, Secretary of Govt of India.